'Tis going to be the season of new cell phones. Boy Genius Report has gotten a hold of holiday inventory lists from Target and Sam's Club. The details are juicy and include the rumored Verizon Motorola Sholes Android phone. 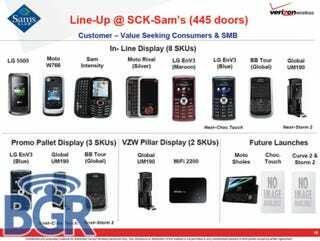 • The Sam's Club document includes the Verizon Motorola Sholes (also been rumored to be called the Droid or Tao). From the tiny picture, the Android phone seems to have a front-facing camera. We already know a good deal of the rest of the specs. Say it is so: Verizon is finally going to get some 'droid! • The Verizon BlackBerry Storm 2 is finally on its way to Sam's Club, Target and Best Buy. It will be joined BlackBerry Curve 2 or LG Chocolate Touch. • Don't forget yesterday's Best Buy leaks: the Nokia Booklet 3G netbook is listed and launching on October 25 with the option of AT&T activation. The retailer will also have the Palm Pixi and plans to have "new BlackBerry devices across multiple carriers."